I’m actually on a cycling holiday from tromso to bodo, so I’m writing this on my phone from a tent. So this article might be not so pretty as you are used to. I actually got in touch with a german collegue who had the same bsod problem and he got the same answer from Dell.de support and will get his PCI h330 raid controller soon so I’m hoping on reporting his results here. So thanks too to Andre from Nacura. I’m not sure how to get the controller when you are ordering a new system, I guess you have to contact Dell and request the pci h330 raidcontroller as a loose part and add it yourself (be sure to ask if the part will fit in your system based on the servicetag). The bsod is actually from where the s2d gets some “noise” from the raid controller on the sas bus and doesn’t know how to handle it and results in a bsod. the road go raid1 has been a long one, I have heard it is because MS didn’t see the need for it. I strongly disagree: think of the manpower needed to rebuilding a node (and the requirement that all driver versions need to be the same) or when a os disk fails or a 100tb resync that happens when a node fails, etc. Luckily Dell and customers disagree and MS listened to them. the 14G servers have a feature that will keep the noise from the sas bus, so raid1 in them should be less troublesome. The s2drn document is expected halfway august, so all this r730 stuff might be in the past. We are actually buikding a 2-node and another 4-node s2d cluster based on the r740xd so we’ll see! still no partnumbers in the s2drn document, i’ll ask my tech contact about that because it will life so much easier. update 20170801: I got good news from Andre from Nacura. He has the onboard-h330-hba in his system and he has put in a pci-h330-raid card for the flexdrives and put it through a loadtest with random reboots without any bsod’s. He also heard from dell.de that this config is fully supported and the s130 will be supported through a fix (not public yet, but it can be requested through dell support). So we should be fine with the r730xd, lets hope it will go smoother with the r740xd..
CBL0009: Backplane 0 connector A0 is not connected. How do we configure the server not to expect the flex bay backplane to be connected to the front backplane? The is supposed to be a bios update to fix the post message, but i haven’t seen it yet. Are you able to let me know who to contact at Dell to get information about when to expect the bios update? ProSupport don’t seem to know anything about it. do you have more Information about the fix for the R730XD that should exist? You mean for the Bios Post message? No, I haven’t heard of an ETA for that. If you mean for RAID1 with the S130, there should be a private fix avaliable through Dell TechSupport. We are currently trying to do this exact setup, I know this is a year ago so sorry for the late post! Can anyone confirm if they got the PCI H330 working for the rear 2 Flex bay drives? We have the Large Form Factor 1×12 R730 XD with the 1×4 3.5″ Expansion cage. All of these work well in the HBA330 but if we connect the SAS cable from the read 1×2 flex bay to the PCIe H330 the system halts due to a cabling error, it needs the 1×2 Flex bay connected to the Main backplane A2. Andre from Nacura has confirmed that he has inserted a pci-h330-raid card for the flexdrives and put it through a loadtest with random reboots without any bsod’s. And I have another one who confirmed this setup worked. If Andre agrees to let hem contact you I can get you into contact with him. 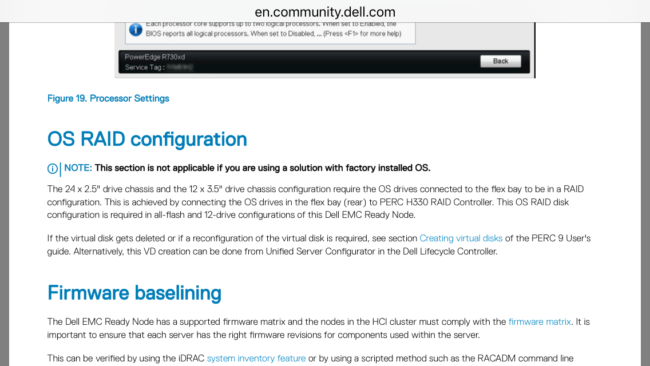 It’s also a supported config from Dell, although i heard some support engineers who deny this, i can give you incident numbers from Dell where this is discussed that it’s a valid config so you can take it up with Dell support. Be sure to update your bios and I’m not sure if the warning the bios gives you is fixed already. The S2DRN document definitely states that it is a valid configuration. We’re currently running BIOS 2.8.0 with all drivers for all devices fully updated. We THINK the issue is that a different cable from normal needs to be used from the Rear Basplane SFF SAS port to the H330. Essentially the A2 Cable disconnects will not go away, even if only the central expansion cage is installed. You must have the rear flex bay connected in order for the central cage to be a valid configuration. Do you by any chance know what the part number of the cable is from the rear flex bay? Unfortunatily i have no hands-on experience with this setup. I researched the issue and was mediator for a few people who ran into the same problem, but we lost way too much time so we went for the S130 setup without RAID because this was a Proof of Concept and the servers were about to be replaced with the R740xd servers which have the BOSS card to solve this problem. I would suggest logging a official support call with Dell to help you. If the engineer is giving you a hard time, i can send you the supportcases who are similar and where there is official confirmation that this is a valid config. Hi guys, have you found a solution to the error while booting? I have setup several different parts to get this error away, but I haven’t get succeed on it. Do you manage to make the configuration works without errors while booting about the A0 SAS cable missing? 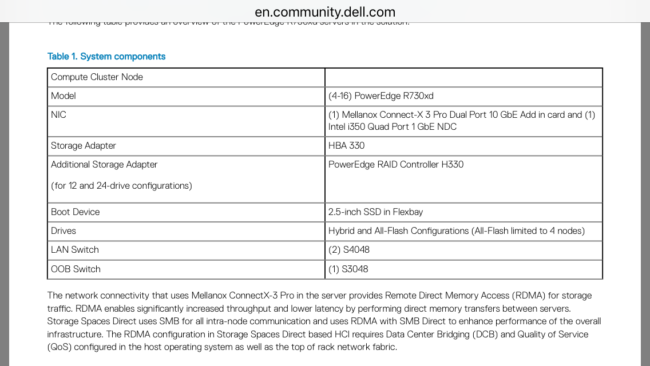 I heard that dell.de said that this config should be fully supported and the s130 will be supported through a fix. This fix was not public at the time, you might request it through dell support. I can give you the corresponding case number if your support engineer says something different. Hello, I have the same problem. I did solve it by disabling f1/f2 promt on error in System bios/miscellenous settings, so the servers didnt halt on reboot. Not the perfect solution but is working for me..
yes, it’s just a cosmetic issue Dell promised to solve. But i’m guessing if you post this you still have the error? Did you update the bios to the latest version? Yes I have the latest bios, the error persist..
You might escalate this through support, I can give you casenumbers if Dell does not cooporate. As they still sell the r740xd machines and it’s a supported scenario, my opinion is that they should fix it. I don’t have the option anymore because our hardware was rented, else I would follow up on this.